Corleone (Zip Code 90034) is 115 km. distant from Agrigento, 133 km. from Caltanissetta, 249 km. from Catania, 152 km. from Enna, 299 km. from Messina, 57 km. from Palermo, which province it belongs to, 251 km. from Ragusa, 324 km. from Siracusa, 101 km. from Trapani. 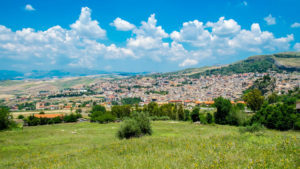 The municipality has 11.277 inhabitants and its area covers 22.912 hectares for a density of population of 49 inhabitants per square kilometre. It rises on a montainous internal area and is 542 abive sea-level. The Town Hall is placed in piazza Garibaldi, tel. ++39 091-8461181 fax. ++39 091-8464453. Corleone, thanks to its geographical position, represents an important centre of cattle and sheep breeding and produces dairying products. Famous is in fact the festival of these products that takes place every year in May and June. Its very fruitful soil produces cereals and grapes of different sorts. Important it is also local handicraft of wood and iron. The name of Corleone derives from an old Qurlian, maybe of Arabic origin but the present shape dates back to XVI century. In 1080 it was conquered by the Normans and in 1095 it was joined to the diocese of Palermo. In the XIII century the emperor Federico II drove the Muslims out and repopulated the small town with a settlement of Lombardi. Already in the XIV century there were fencing walls round the town and inside the first nucleus of people had taken place, it is still now visible. Between 1440 and 1447 it became a feudal village property of Federico Ventimiglia and ransomed its freedom only at the early of the XVII century. During the XVII century, Corleone had had economic and productive crisis that led in a mass emigration lasted until post-war period. In the artistic field there are the Church of St. Rosalia that dates back to the XVII century and the Church of St. Andrea that according to tradition was built on the ruins of an old mosque. Also the remains of the Torre Saracena (Saracen Tower) which is called “Soprano Castle”. An important historic event is the militar manouvre made by Garibaldi in May 1860. He pretending to want to attack the town of Corleone, on 27 May of that year, he led in a victorious way his troops on to Palermo.